Subscribe and receive a new BackRubz Special savings every month. Age Reversal Event Facial "Plump and Go"
Purchase Gift Certificates Online or at the Studio. Give the gift of massage and beauty - delight in the biggest smiles when presenting your BackRubz Gift Certificate. 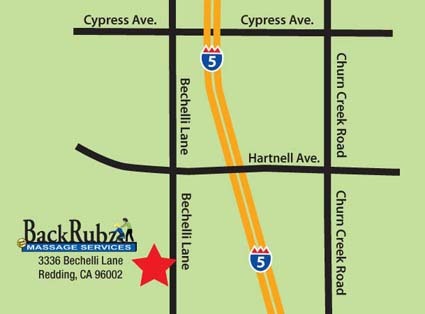 You may purchase Gift Certificates at the BackRubz Studio on Bechelli Lane or online. Online Gift Certificates can be printed out and presented in person or emailed to your recipient. All major credit cards accepted. Transactions through PayPal Secure Check-out. You do not need a PayPal account to use your credit card. Practicing since 2008. Ashley works out tight muscles like no one else! Her hands go naturally to the spots that need targeted work, and she smoothes out entire muscle structures to leave your muscle tissues relaxed and even-toned. With special bars as hand extensions, she can reach the hard spots with light to deeply firm pressure. She is an excellent choice for Deep Tissue Massage. Cameron is a State Certified Massage Therapist and Health Educator. He is a Graduate of National Holistic Institute College Of Massage Therapy (36 Credit Hour Program Accredited.) Cameron is trained in a wide range of Eastern and Western modalities, techniques, and related sciences including but not limited to: Shiatsu, Myofascial Therapies, Traditional Chinese Medicine, Thai Massage, Rocking & Shaking, Hot Stone, Deep Tissue, Swedish, Proprioceptive Neuromuscular Facilitation, with the ability to customize integrative session's to meet the needs of each individual client. Practicing since 1996. Charlie's experienced hands are especially great for target work; she really gives fatigued and/or injured muscles the attention they require; she hones in on the problem and is persists until the muscle fiber and tissue is relieved. Charlie is an excellent choice for light, medium, and very deep massage preferences. Heather is a California State Certified Massage Therapist and has been practicing since 2008. Heather has a unique style that is easily tailored to each client's individual needs based on the day of the session. She can work all levels of muscle tissue using a lighter Swedish style or get into the deeper levels with deep tissue techniques all while getting your mind to relax as well. Heather is trained in Trigger Point Therapy, Swedish massage, deep tissue, Thai massage, Myofascial Release, pregnancy and Sports Massage. Practicing since 2005. Jenn has Swedish-based education in Massage Therapy. She practices an array of therapies that she combines to personalize each client's session. Jenn observes postural distortions and uses pelvic stabilization and deep stretching to relieve tendons and ligaments of stress and fascial restrictions. Whether it be a more relaxing, therapeutic massage or target work, Jenn is an educated, well-rounded therapist, practicing techniques like Deep Tissue, Neuromuscular and Trigger Point work, Sports Massage, Myofacial, Hot Stone, and techniques from CranioSacral work. Kathy's hands soothe and relieve problem areas using a combination of techniques that are chosen according to the need of the client. These include Acupressure, Massage and Healing Touch Therapy. Kathy is a California State Certified Massage Therapist and has been doing massage for 23 years. California State Licensed Esthetician, Graduated Shasta School of Cosmetology in 2017. Specializes in holistic natural skin care. Goal is to create a relaxing experience with optimal skin results targeted to your individual skin type and need. Practicing since 2005. Lori specializes in customized treatments for the individual person she is working on, based on their needs on the day of the appointment. She has a passion for helping people, and uses essential oils to treat pain, release emotional tension, and balance the chakra's. Lori can perform light, medium and deep massage Lori is a California State Certified Massage Therapist practicing massage for 12 years. Sharon has been a California State Certified Massage Therapist since 2009. She's a clinically thorough therapist, working each area of the body several times during the massage session. She has a gentle touch when needed as well as the capability to work very deep to customize her massage to the client's needs. She believes that each client should be approached individually and combines different modalities to fit each individual. Her techniques include Swedish Massage, Deep Tissue Massage, Rain Drop Therapy, Craniosacral Therapy, Foot Reflexology, Basic Lymphatic Drainage, Myofascial Release, Positional Release, and Chair Massage. Sharon is passionate about treating serious athletes and "week-end warriors" alike. She has helped clients recover from injuries and illnesses as well as helping clients who are looking for relaxation. Practicing since 2005. Sherry's hands guide each session into techniques that are perfect for individual muscle needs. Her experience in massage relaxes muscles into submission. Sherry can work light, medium, or firm/deep pressures, depending on what each client prefers. She is a California State Certified Massage Therapist, and practices Zone Therapy. Webmaster Martin Horn Creative Media.